We have a Checks or Plaids theme this month. If you have arrived from From the Heart Stamps blog, you are in the right place, if not why don’t click the link and start from the start, so you don;t miss anything. Now head over to Imke's Blog and leave a message if you haven't already. Don't want to see you a miss a chance, especially since Faith has been drawing and adding new images to the shop daily!! Thanks for hopping with us today. The hop will end on Monday September 7th at 6 am EST. Winners will be posted on the From the Heart Stamps Blog on Wednesday September 9th. So cool Calypso. Love the white on black, it does look just like a black board. Adorable card! So cute. I love the chalkboard look. Such a fun stamp! I wouldn't have thought to use the image this way, and it is perfect! Calypso, this is fantastic! I love it!! What a great way to showcase that snowman! Love the blackboard effect! WOW!!! What a cool idea! You are so creative! Love the chalkboard effect, Nazeem. Great mix of dp! Love your card!! That snowman sketch on the blackboard is so cute! I know some teachers who would love that image. I love how you reversed out the image and type on the blackboard. Very clever! I love the color combo too! Fun. Love the colors, patterns and the chalk board effect. That was clever!! Did you just print in white or did you do something special - I love it! This is awesome Calypso! Just love the chalkboard. Wondering how you did that as a printer doesn't ever print white. Did you print a negative image? Please do share! I agree totally creative and cute. He doesn't even look like a snowman this way. Can you tell us your secret to how this was done? Love it! What a great, cute image and topic! I like that chalkboard, super idea! And please, would you tell us your secret how you did it? Fabulous card! LOVE the chalkboard and that image is perfect for it! Awesome papers too! Super cute! Any teacher would love it! Like the blackboard with a school theme. Lovely BG paper too. Love the chalkboard effect! What's your secret to getting it on the chalkboard paper? Love your paper choice! Great work! Thanks for joining us at Creative Corner Challenges! Love the chalkboard look of the stamp. Your card is just adorable. 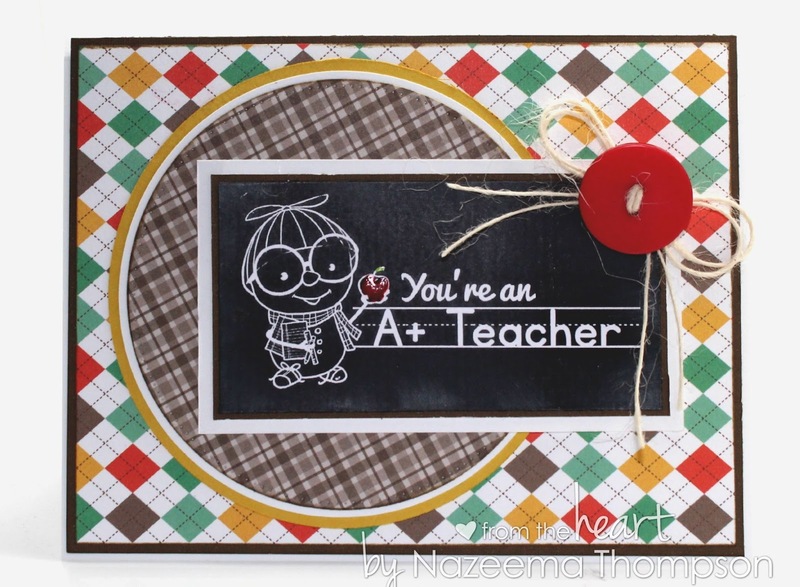 Wonderful card with this cute image, so creative! Really fun and such a cool idea to use the blackboard technique for the cute Back To School Snowman. Awesome work! Awesome card. I will definitely be checking out your tutorial for the backboard technique. Great job! Gorgeous card and awesome technique! I really enjoyed your tutorial so I decided to do your blog hop! I might learn some other new techniques! Thanks for the inspiration! Such a cute card! I have this snowman set and will have to try that reverse chalkboard effect. Thanks for sharing that! I love the chalkboard!!! Fabulous colors! Love the chalkboard - it looks so authentic. Such a adorable and fantastic card design. Love the details.Thanks for your entry in our challenge at Frosted Designs! just so clever to use the chalkboard technique on this cutie! I love it! What a sweet card!! Thanks so much for participating in our IF YOU GIVE A CRAFTER A COOKIE... challenge!!! Can’t wait to see you participate again in our next challenge!! Stunning card. Thank you so much for joining us at Give A Crafter A Cookie Challenge. Super cute. Thanks for sharing at frosted designs. Great card, and great tutorial. Nice and clear for a non-techo like me. Love this so much!!!!!!!!! Thanks for playing along with Frosted Designs!!!! !